PostEurop is proud to announce Turkish Post PTT (Turkey - Gold), Poczta Polska S.A. (Poland - Silver) and Georgian Post (Georgia - Bronze) as winners of the 2018 EUROPA Stamps online competition through public voting. Winners of the EUROPA Stamps Jury prize competition, selected our group of Philatelic experts are bpost (Belgium - Gold), Magyar Posta & Posti Group (Hungary & Finland - Silver) and Hrvatska Pošta d.d. (Croatia - Bronze). In this year’s edition, a total of 57 en tries were submitted based on the theme "Bridges". The results of this year’s online EUROPA Stamp competition were disclosed during the PostEurop Plenary Assembly in Tbilisi, during a special gala dinner celebrating the Associations' 25th Anniversary. 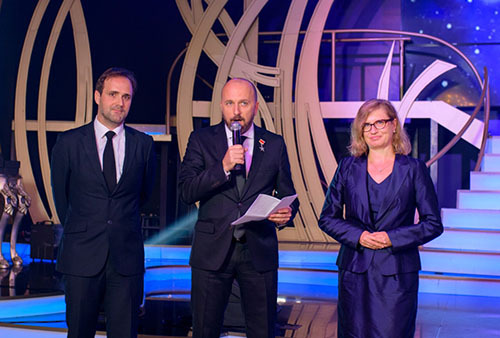 Turkish PTT (Turkey), Poczta Polska S.A. (Poland) and Georgian Post (Georgia) were revealed as the top three winners respectively. "I am very proud to announce that this year we had a record number of votes, a new milestone of 23 thousand! It makes me happy to see such level of engagement from voters all around the globe, in philately. The outcome of this year's competition is a great reward for the magnificent designers who via their creativity has created authentic works of art made with different production techniques, including engravings with different layers, watercolour paintings and photography" said Agnieszka Trząskowska, Chair of the PostEurop Stamps and Philately working group from Poczta Polska S.A.
A jury composed of seven philatelic experts participated in the EUROPA Jury competition. Each displayed entry was scrutinized and deliberated by the jury. The jurors casted their closed ballots and two rounds of voting were necessary for the group of experts co-chaired by Dr. Botond Szebeny and Dr. Guy Coutant to proudly announce bpost (Belgium) as the winner of this year's 2018 EUROPA stamp Jury Prize. This year, there was a tie for the second-place, which went both to Magyar Posta (Hungary) and Posti Group (Finland). Hrvatska Pošta d.d. (Croatia) was named the third-place winner of the competition. “Bridges are a powerful element of the European architectural scene, which can reflect the cultural diversity present across the continent. It symbolises the spirit of unity between nations. Therefore, I was extremely pleased to see so many beautiful entries that could perfectly depict these elements. I have to congratulate all of the designers for being able to produce such great designs, they really made it difficult for the jury to elect this year’s winning stamp” commented Botond Szebeny, PostEurop Secretary General. The awards for the 2018 Jury competition were delivered to the postal philatelic community on Saturday, 15 September 2018, at the distinguished Brussels Town Hall, during the Belgian Philatelic Grand Prix ceremony, where philatelists and dignitaries from all over Europe gathered. Congratulations to all the winners and we look forward to next year’s “National Birds” entries. Since 1956, EUROPA stamps have been a symbol of Europe’s desire for closer integration and cooperation. These special stamps are issued by the European postal administrations/enterprises and bears the EUROPA logo, a PostEurop registered trademark. Since 1993, PostEurop has been the responsible organisation for issuing EUROPA stamps and each year, philately experts within the Philately working group organize the competition amongst other philately initiatives.